You are here: Home / News / News / Education / NCS / NCS Matchday takeover! NCS Matchday has returned with EFL clubs from all three divisions uniting to show their support for the programme which is focused on providing opportunities for 15-17 year olds. 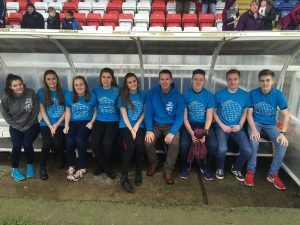 The NCS Matchday takeover has proven to be a huge success in recent years, with the aim to increase awareness and participation. In the coming weeks, clubs all across the land will host their NCS Matchday. The club’s first team players will have an important role to play by warming up in NCS branded t-shirts and meeting programme graduates. NCS graduates will be in attendance throughout the day to discuss their experiences of the programme to younger supporters. NCS is a nationwide experience for 15-17 year olds. It is a unique opportunity for young people to learn new skills alongside having fun and creating unforgettable memories. More than 275,000 young people have already said yes to NCS. 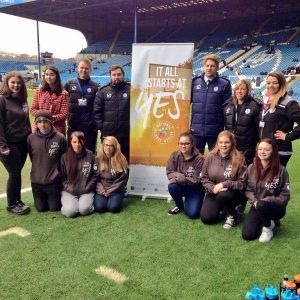 John’s views were echoed by Cara Harrison, an NCS graduate from Sheffield Wednesday. Talking about the NCS Matchday, she said: ”It is good that clubs participate in NCS match day and important that we spread the word. https://www.efltrust.com/wp-content/uploads/2017/02/3.jpg 400 600 EFL Trust https://www.efltrust.com/wp-content/uploads/2016/06/efltrustlogo.png EFL Trust2017-02-10 09:00:002017-02-09 16:40:23NCS Matchday takeover!